At first glance, the current state of Bangladesh appears to be a paradox : a country under a state of emergency, but where the general public seem quite content. The military-backed caretaker government has slapped a ban on all political activities, and the security forces have been busy picking up political leaders in the middle of the night and throwing them into jail. 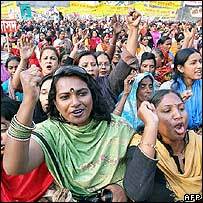 But there is little outward sense of repression, and Dhaka's social elite, usually most vocal against human rights violations, appear most pleased. The reason for this apparent sense of satisfaction is not difficult to see. The treatment meted out to politicians is not being seen as repression. People across the board see them as retribution for the corruption and abuse of power of the past fifteen years. By the time the state of emergency was declared in January, the public had also become fed up with the constant bickering and street-fighting between the two main political parties. At second glance, it becomes clear that the country has reached a crossroads. Go one way, and the road leads to cleaner politics with free elections and restoration of representative democracy. 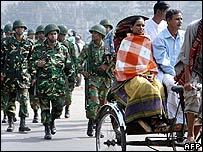 But go the other way, and the country risks sliding back into the kind of military-led dictatorship which so blighted Bangladesh's politics and economy in the 1980s. Officials say the tough campaign against 'corrupt' politicians and 'crime godfathers' is needed to clean-up politics once and for all. To achieve this, they need to dish out exemplary punishment to some ''big fish''. The biggest fish of them all is Tarique Rahman, son of former prime minister Khaleda Zia and leader of Bangladesh Nationalist Party (BNP). Rahman's arrest and subsequent charges against him reassured a lot of people that the government meant business. "There is no alternative to healthy politics , and politicians who are clean and qualified," said Kamal Hossain, a former law minister and a keen backer of the government. Everyone agrees with Mr Hossain's goal; but not everyone is so convinced that the current method is the right way to achieve it. With civil liberties on hold, the drive to arrest politicians shows all the finesse of a 1970s South American dictatorship. "The army should not point fingers at politicians," said Farida Akhter who heads a radical NGO in Dhaka. "Why aren't we talking about corruption in the army?" Ms Akhter is concerned that the state of emergency has curtailed some basic civil rights and there is no end in sight. "I am a little scared. If I have a grievance then I can't go out to protest or demonstrate in the street," she said during a discussion organised by the BBC. The constitution allows the state of emergency to run for four months, before being renewed by parliament. But with no parliament in place and elections unlikely at least until the end of 2008, the state of emergency appears set to drag on. The Election Commission says elections cannot be held until all electoral reforms, including drawing up of a new voters' list with photo ID, have been carried out. This gives the government nearly two more years in office. Two years is a long time in politics, and questions about its mandate and accountability are likely to rise. The debate over how much power and life-span an unelected government should have, particularly with no mechanism for accountability to the public, is likely to begin in earnest. In the meantime, the government is likely to press ahead with its programme to bring about major changes in the political landscape. Many people in Dhaka think the caretaker government wants to pressure the major political parties to jettison their existing leaderships. In that sense, they think the anti-corruption drive may be aimed at disqualifying senior and middle-ranking leaders from standing for public office. There is also talk in Dhaka that some politicians may be given immunity from prosecution if they agree to leave politics forever. Some leaders may be allowed to leave the country rather than face jail. "Politics will undergo fundamental changes. Those leaders who can adapt to the new ways of doing politics will stay, and those who can't, won't", says Mainul Hossein, who is in charge of the law and justice ministry. But there is another group which may wish to have the final word: the military, which is showing increasing signs of political ambition. This impression was strengthened by army chief Lieutenant General Moin U Ahmed's recent public speech which indicated that he believes he knows more about democracy than the politicians. "Bangladesh will have to construct its own brand of democracy," the General told an appreciative audience of political pundits, retired bureaucrats and foreign diplomats in Dhaka. "This needs rethinking so that we can re-invent a system of governance with new leadership at all levels." Rethink, re-invent, new leadership, new brand of democracy. These are loaded words, particularly at a time when political parties and leaders are being vilified from every corner. The targeting of political leaders by the interim government and the media has made corruption virtually synonymous with politics. Some observers in Dhaka are concerned that this vilification of politics risks creating a situation where the public accept a military-led dictatorship as the lesser of two evils. 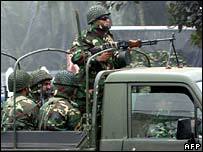 But few in Dhaka feel the army is interested in taking power in the same way it did in the 1970s and 1980s. "This is a much more sophisticated army, exposed to the world through UN peacekeeping operations," said one observer in Dhaka unwilling to be identified. "They are working through civil society groups, keeping its relations with the international community sweet". Earlier speculation had suggested that the army would sponsor Nobel Peace prize winner Dr Muhammad Yunus as a new leader. But his first attempt at floating a new political party has already failed. "Dr Yunus is still viewed as a credible candidate by elements in the army," said the observer. "Whether he has the stomach for a long stint in politics is another matter." Military watchers in Dhaka think cohesion within the army and unity of purpose among senior officers is the key to ensuring a smooth transition from the current caretaker to an elected government. "Lack of such unity and cohesion, particularly on the question of anti-corruption drive and political parties, could lead to tension in the cantonments," said the observer. Much debate now centres on whether the army is looking for a longer-term, formal role in determining the future political direction of the country. One idea currently being debated is to set up an all-powerful National Security Council, to be dominated by the military and intelligence agencies. The big question is, how much authority an elected, political government will be able to exert over such a body. Tarique Rahman - flawed heir apparent? Is Bangladesh heading towards disaster?